Working in unique, remote locations is one of Jane Tibble’s abiding interests so it’s little wonder that she ended up at Longitude 131° in the Central Desert of Australia’s Northern Territory. 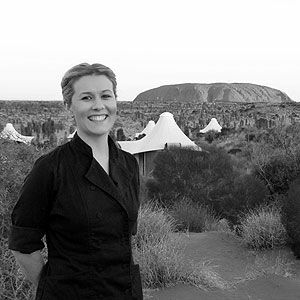 Despite the obvious challenges —not having the flexibility to speak face-to-face with suppliers or inspect produce— Jane says that she loves the kind of people who are drawn to Uluru. With fourteen years of experience in both Australia and New Zealand, Jane’s ethos is very much that of someone who has ‘done their time’ and learnt that simple is beautiful. She maintains that the most important elements of a top dining experience are the freshest ingredients possible for your dining environment, dishes that are well seasoned and not overcooked, great company and good wine. Jane says that her influences are not specific to any one mentor or cuisine but instead are drawn from many cultures. The key to her approach is home-style, non-fussy fresh food that is cooked well and is recognisable on the plate and prepared by chefs who go out and get their hands dirty, finding and growing their own produce. However, she also says that she respects the wacky theatricality of Heston Blumenthal’s creations despite her belief that food is like fashion, trends come and go but the classics are what dominate. What makes a signature dish? When guests request the recipe for this dish, it's sign of a signature. I love different textures, aromas, colours and tastes, and am often inspired by books. Also from time spent working back home in New Zealand and living around Australia. My husband’s stories from his world travels. I will focus a lot more on the use of Indigenous bush food and incorporate it in my dishes using unique and original ways; bringing the garden-to-plate experience into play. When I was little, about four years old, I used to grab anything I could reach from the cupboards, golden syrup and cocoa being my favourites. I would hide under the kitchen table and ‘create’ in my own little ‘kitchen’. Basically I was making a huge mess for my mother to clean up, but I had loads of fun! Patience is golden in the kitchen. In everything you do make sure the fundamentals are perfect. Without this, the simplest dish can be ruined. Throw it out and grab a can of tomatoes, an onion, garlic, olive oil, fresh oregano, lemon, salt and pepper and make my own tomato sauce.